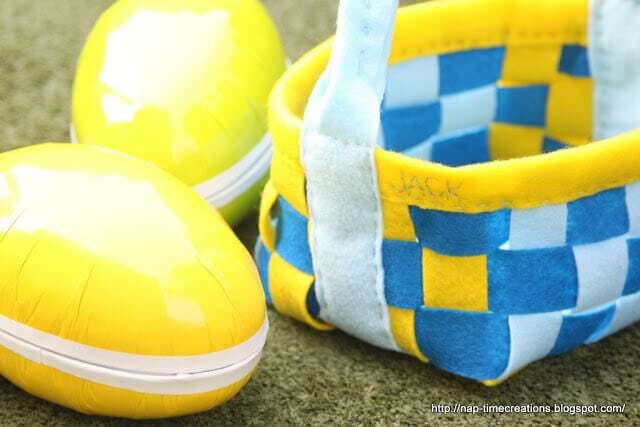 Today I have a fun project from the vault… Easy, fun and entirely customizable for your Easter needs… (size, color, etc…) Weave felt to create your very own woven felt Easter basket! I’m SO excited to share this tutorial with you today. 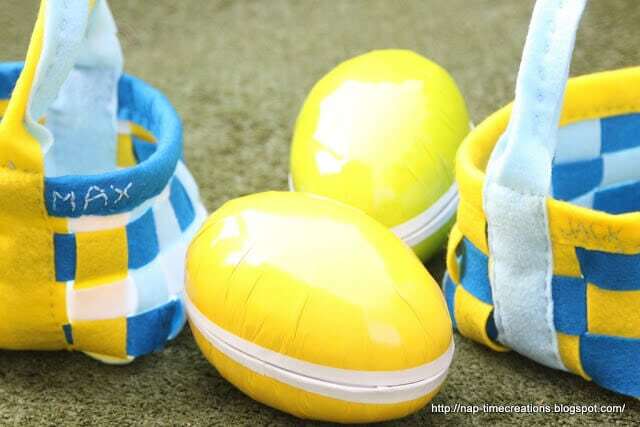 I’ve been wanting to make Easter Baskets for couple of years now… they boys are getting older, so I finally did it. I LOVE the result. 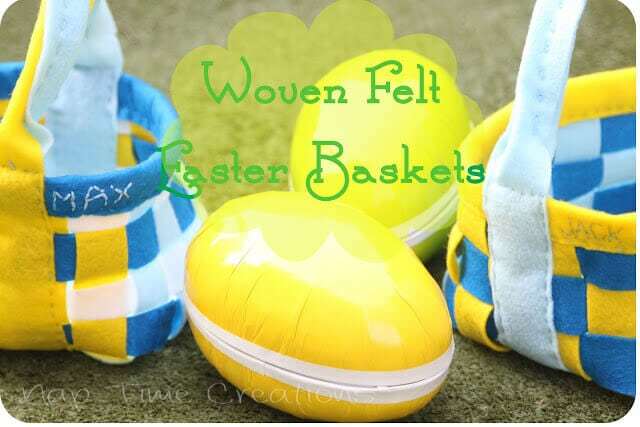 Growing up we had adorable baskets that my Grandma made and I wanted to have something homemade for my boys as well. 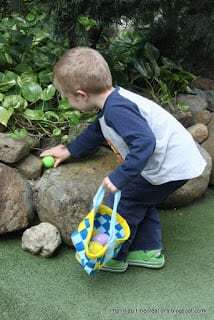 We did a test run egg hunt and they worked great! 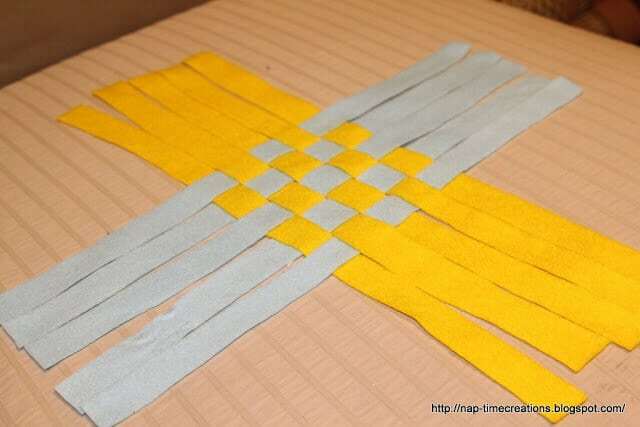 Start with 10 strips of felt. (the stiffer the better!) You can see in the picture that mine were about 19 x 1, but you can make it any size. 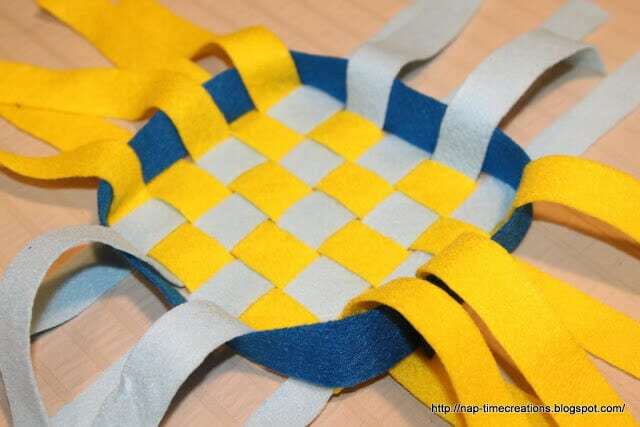 Begin by weaving the bottom of the basket. The dark blue sides are the same width, but longer. I didn’t measure… but you can estimate by measuring around the base to see the size you need. 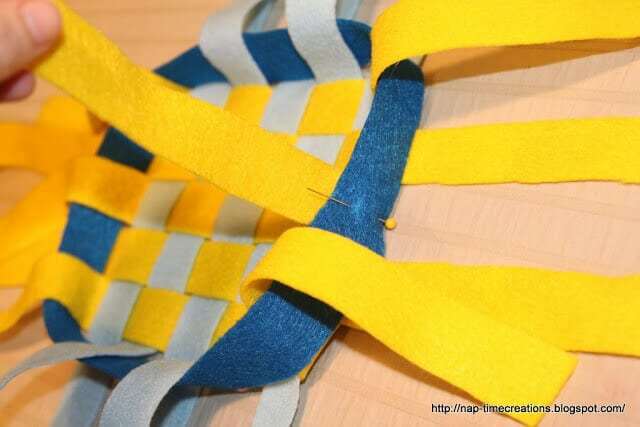 Pin the ends together to keep the piece in place while you go up. Keep the weave as tight as possible and keep pinning the ends together as you go. Keep all the ends in the same place, you will cover these with the handle. 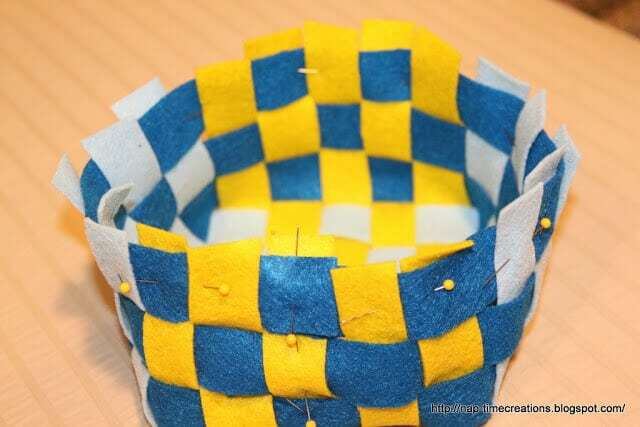 When the basket is the right height, pin around the top and trim the ends. Sew up the side… you don’t have to be neat, this part will be covered later. I really like the finished result! a Beautiful felt Easter Basket! 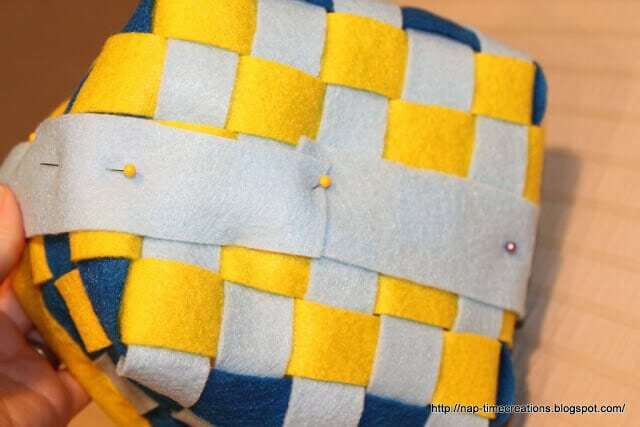 What do you do with felt? I love that there are so many uses for felt! 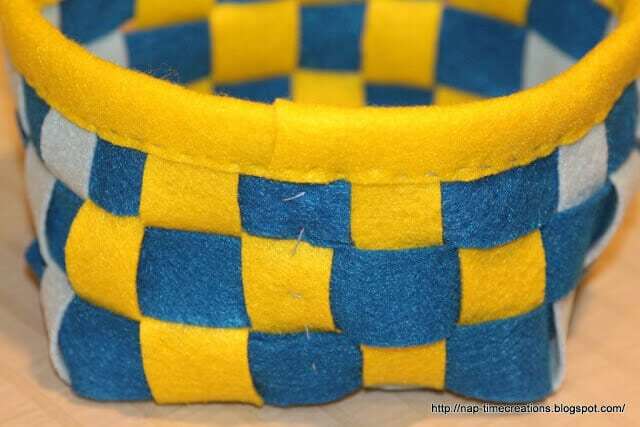 It’s a beautiful basket – love the colors! 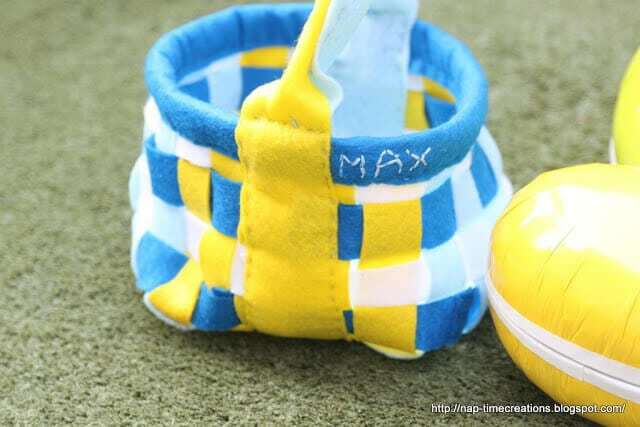 These are so cute – I especially love how you stitched the boys names on! 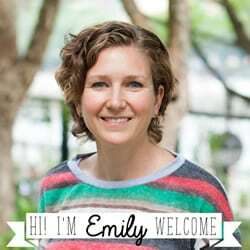 We’d love for you to share that (and anything else you’d like) at our Beautify It Monday Link party going on now at BringingBeauty.blogpsot.com! These are so cute and easy! LOVE this. They would also be easy to store! Those are so cute!! I love how felt is so versatile! These are so adorable! Thanks for sharing at Manic Monday. So sweet. I love the personal touch of sewing on their names! That is brilliant. I love the step by step photos too. This looks great! Thanks for sharing…. You make that look so easy! They are so adorable!!! Wow. You are dangerously crafty! Handmade, personalized baskets are so special! Thank you for sharing! 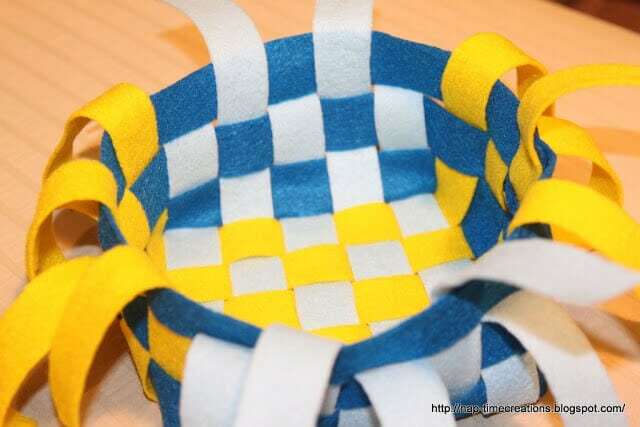 Wow your baskets are so wonderful, how did you know how to make them? So smart. Your tutorial is great, really shows how to go about each step. Glad you shared this, I’ll be printing this out and save in my projects notebooks to make soon. Happy Spring, Your boy is so cute. Thanks so much for posting this. 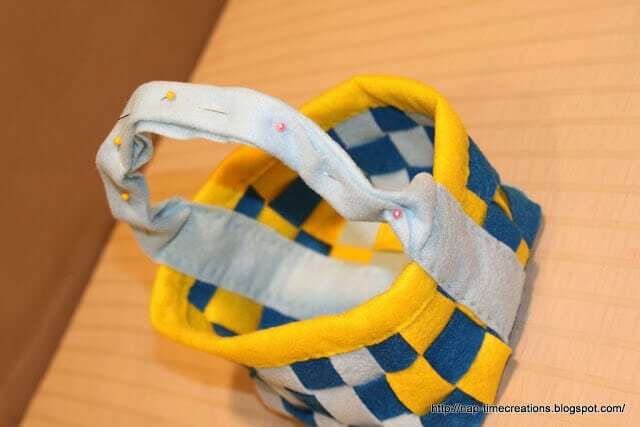 I love this idea and may try to make baskets for my daughters…. 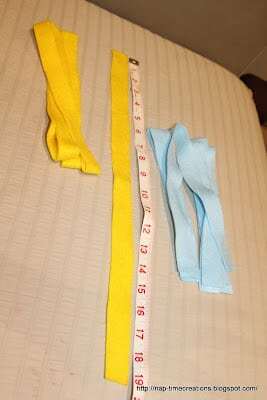 This may sound like a dumb question/ but how did you cut your strips of felt so straight? Did you use a ruler and trace lines, then cut?? 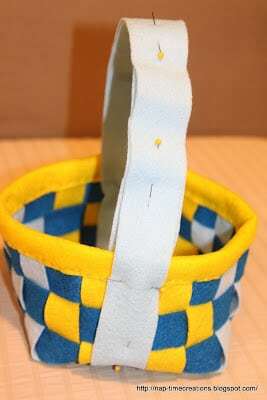 (I am a beginner at crafts and sewing… As you may have guessed from my question). Hope to hear your reply and thanks very much….